As an American, this is one of those stories where I have to say, “I’m glad he wasn’t American”. 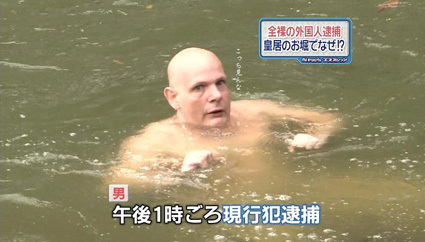 Fuji TV reports of a Spanish man who came to Japan on in a tour group. 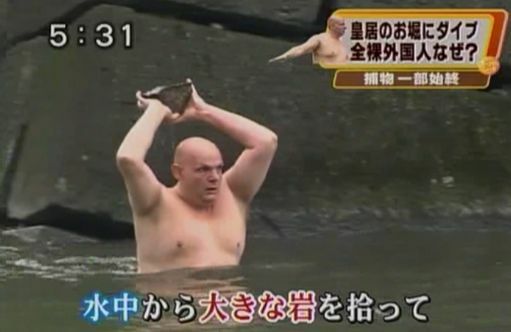 Apparently he dove into the moat naked in order to retrieve a bag dropped by his friends. I’m not sure how things are done in Spain, but this guy seriously had some issues. Reports have even said that he undressed after jumping into the moat. It took police over an hour and a half to capture the man. He evaded capture by throwing rocks and chasing after his would be captors. I don’t blame the police for running. He’s not only a pretty big man, but a pretty big naked man. Even if one could accept him going in naked to keep his clothes dry while going after the bag, why fight the police? This incident could of been far less news worthy than it has now become. Via Japan Probe, FG, Tokyo Times.